조용한 지역에 자리한 Own Recoleta는 세련된 4성급 호텔이며 명성 높은 아트 갤러리, 극장, 박물관과 쇼핑 지역에서 도보 거리 내에 위치해 있습니다. 무료 WiFi가 완비되어 있습니다. 07:00~10:30 사이에 다양하게 구성된 조식이 제공됩니다. Own Recoleta에서 알베아르 대로, 산마르틴 공원, 레꼴레따 지구와 Quintana Avenue는 단 몇 블록 떨어져 있습니다. 또한, 호텔 가까이에서 플로리다 거리, 갈레리아스 파시피코 백화점, 푸에르토 마데로, 5월 광장과 대통령 궁 등 여러 명소를 발견하실 수 있습니다. Close to all stations but in a pleasant area. Stayed here again as it is in such a good position for transport links. We needed to get to the airport early and the Manuel Tiendas Leon airport bus departs from the station only about 10 minutes walk away. Also links all across Buenos Aires are only ten minutes walk away. Our only disappointment was the packed breakfast - croissants and cold coffee. This is a good hotel and they should do much better!!! a good hotel within walking distance of all the major attractions, shopping and travel options as retiro is just 5 minutes walk away. rooms are large with fridge, hob, kettle and sink ( dishwasher!! ). breakfast is plentiful with bread/croissants, ham, cheese, cereals, yoghurt, fruit and pastries. there is a very large disco supermarket just around the corner. rooms are clean and comfortable - if you can get a good deal on a suite go for it!! staff are very friendly and helpful and there is a small pool at the back. this is our third visit here so we would certainly come back again. Great location, hotel staff is very kind. Great location, near Recoleta area and Microcentro area. Pity I had water dripping from the tap all the night. 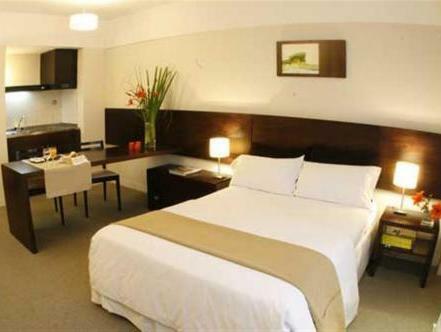 Very nice location and comfort in Buenos Aires downtown. Normal service and good rooms. we liked the suite very much. we were happy to get a suite with a big balcony. the staff were very friendly. 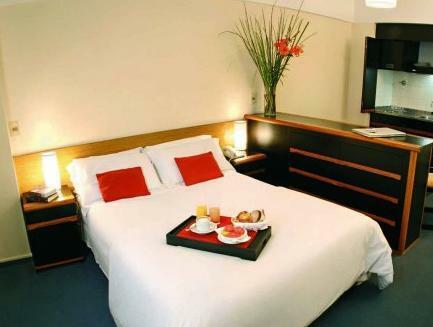 the hotel was situated close to shopping streets and nice restaurants. I enjoyed my stay at this hotel and will definitely stay there again the next time I go to Buenos Aires. Service was excellent - with lots of smiles! It was surprised that the room was old with simply kitchen and a bath tub without plug. Generally facilities　were good. Chambre grande avec un très bon lit et coin cuisine. Salle de bien un peu vieillotte. Chambre donnant sur la rue et donc bruyante. Petit déjeuner satisfaisant. Quartier un peu éloigne de la vie nocturne mais proche de la gare et du centre ville. Wifi gratuit. Das Hotel ist schon etwas in die Jahre gekommen, das Personal war aber freundlich und zuvorkommend. WIFI hat nicht funktionniert obwohl vom Hotel angeboten. Das Gym benoetigt dringend neue und moderne Geraete, da der Zustand des Gym ungenuegend ist. Der Fruehstuecksraum ist klein, das Buffet ist mittelmaessig. das hotel ist gut und das frühstück war immer ausreichend und es wurde sofort nachgelegt.der pool natürlich sehr klein,aber auf den fotos sieht immer alles besser aus. aufpassen bei der buchung das die taxe schon im preis enthalten ist,ansonsten kommen nochmal 21% oben drauf. freundlicher und aufmerksamer Service, angenehmer Aufenthaltsraum, sehr gutes, reichhaltiges Fruehstuecksbueffet. Die Zimmer sind eigentlich Apartments, inklusive einer kleinen Kueche, sehr gross und hell. Das hat mich besonders gefreut, da man als Alleinreisender oft in ein dunkles, enges Loch mit Ausblick auf den Lichtschacht und Klimaanlagenlaerm gesperrt wird, egal, welche Kategorie man gebucht hat. Die Einrichtung u. das Badezimmer hat schon bessere Tage gesehen, hat mich aber nicht gestoert.